We develop software solutions for sustainability management. That way we can support companies in measuring, improving and communicating their sustainability performance. With our portfolio of solutions, which covers all important areas of modern sustainability management, you can make your corporate sustainability activities more transparent, efficient and reliable – from the materiality analysis and the performance measurement to the finished report. You can choose the required modules flexibly and thus create a unique software solution, tailored to your needs. WeSustain was founded in 2010 by an experienced management team that worked for nearly a decade in the SAP ecosystem. Today, we rank among the world’s top four providers of Enterprise Sustainability Management (ESM) software. Currently, almost 600 companies and institutions use our solutions for their efficient software-based CSR management. Our goal is to make sustainability an integral part of organizations, both in private as well as public sector. The most important factor for us is close contact, involving our customers and partners to lay the foundation of continuous improvement for our tools and our company overall. Of course, we realize the sustainability concept in our daily corporate activities and officially support the United Nations Global Compact. Furthermore, we release the SUSTAINABLE Code Declaration of Conformity every year and assume responsibility as a company that takes on trainees. GRI certified software and tools come with the guarantee that the relevant content from the GRI Standards is correct, enabling robust and transparent reporting. 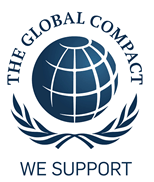 We are proud to announce that our company WeSustain is a fully accepted member of the United Nations Global Compact. Many of our clients already use our ESM solution to report easily and efficiently according to different standards like GRI G4, ISO26000 or the criteria of the UNGC. Therefore, we would like to set a good example and sign up to observe and to support the ten principles of the UNGC regarding the focus areas human rights, labour, environment and anti-corruption and to yearly reveal the development of our sustainability efforts. We ensure to act in every respect in accordance with the requirements of the UNGC and plan to support alliances for the accomplishment of the general UN goals. Our Communication on Progress (COP) will frequently provide all information about our sustainability activities and our commitment within the Global Compact. With more than 7.000 member companies, the UNGC builds the world’s largest CSR network. As a voluntary strategic initiative, it strives to motivate companies to align their business activities and strategies with the ten mentioned principles to create a sustainable and inclusive global economy. Moreover, the UNGC enables its participants to exchange experiences relating to sustainable business and supports voluntary commitment to achieve the Millennium Develop Goals (MDGs). Find our recent sustainability code signatory here.